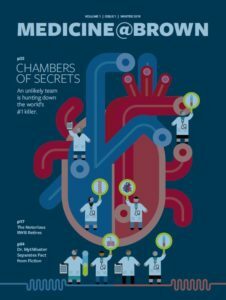 Published three times a year by Brown University’s Office of Biomedical Communications, Medicine@Brown is the alumni and news magazine of the Warren Alpert Medical School. It is intended for both internal and external audiences. These include Warren Alpert Medical School students, residents, alumni, faculty, staff, parents, and donors; Brown University alumni who earned their MD degree from another institution; the Rhode Island medical and lay communities; deans of US medical schools; and appropriate individuals and interest groups. The goals of the magazine are to create a connection between the Warren Alpert Medical School and its many constituencies, especially alumni; to inform readers of the activities and accomplishments of its faculty, students and alumni; to encourage an exchange of ideas and opinions on issues relating to medicine and medical education; and to increase the visibility of and support for the Medical School. To accomplish these goals Medicine@Brown seeks to reflect the interests of its readers while engaging them in an interactive relationship. The opinions of contributors do not necessarily reflect the views of Brown University, the Warren Alpert Medical School, or its affiliated teaching hospitals.